Do you ever find yourself in need of a simple but cute gift for a creative type? Whether it’s for your kid’s favorite teacher, your crafty neighbor, or your friend that just could use a happy just because gift I’ve got an inexpensive and fast idea that is sure to be loved. 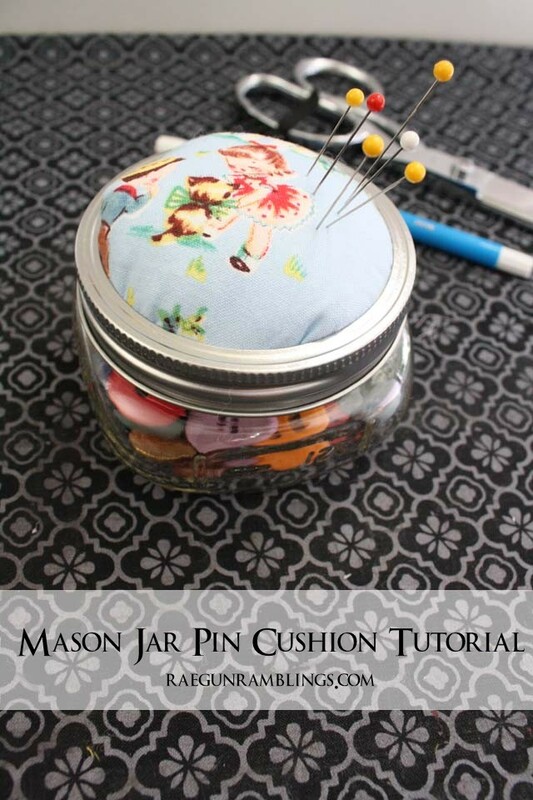 A Mason Jar Pin Cushion. My friend made me one of these a few years ago for Christmas and I fell in love. I use it all the time and it sit on my ironing station. But I got to thinking of all the other places I could use the cute extra storage. 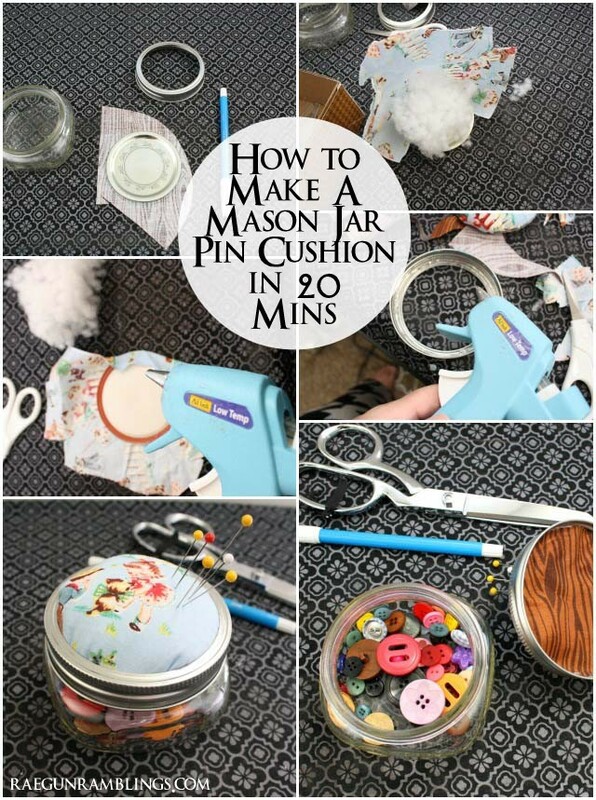 My favorite part of this is that you can make so many different sizes just by varying the size of the mason jar you use. 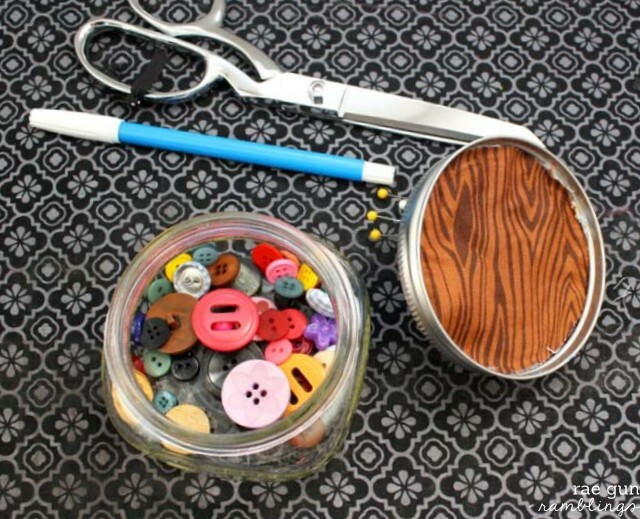 You can keep buttons in a small one, pens or even washi tape in a bigger one. Really the possibilities are endless. 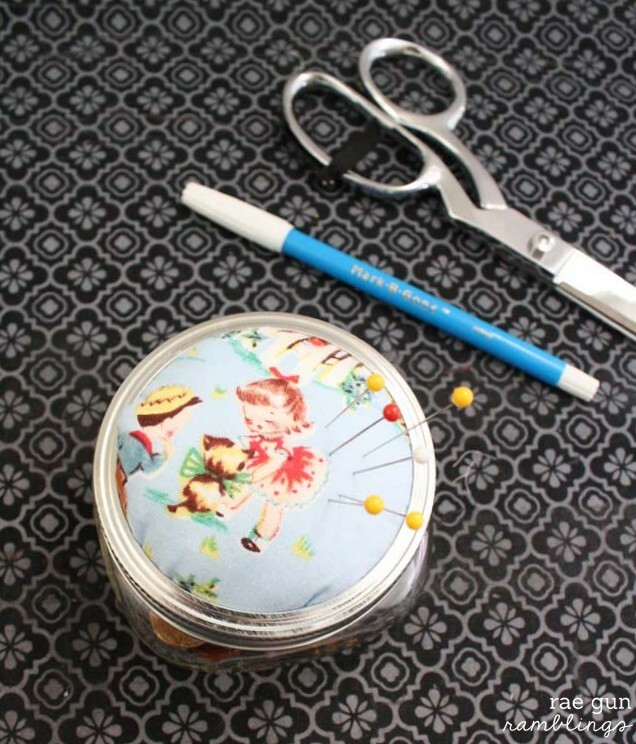 Just fill the jar part with some fun craft supplies and your got a darling gift idea that costs hardly anything. 2 fabric scraps (one big enough to trace the circle part of the lid and one big enough to form the pin cushion mound as long as you have a 2 inch border you should have plenty of fabric). 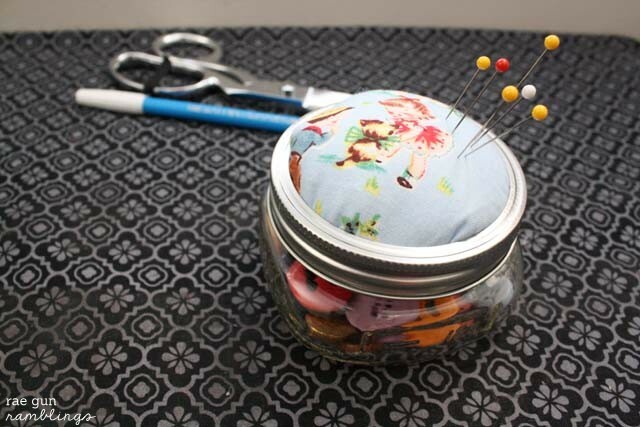 Start by tracing your lid onto the inside fabric. Cut your outer fabric 1-2 larger than the lid add a small a small amount of batting and glue the cover leaving an opening to stuff even more batting. Stuff full and finish gluing. Cut out and then glue to the inner side of your lid. Glue the cushion you have made to the ring part of the lid. And you’re good to go. Fill with fun trinkets! All you have to do is fill it with goodies and give to a friend. I gave this one to my Secret Sister, Elizabeth from Simple Simon and Co at Snap! What a cute, cute idea! Kids could even make these for mom’s birthday! Just a note… if you put some steel wool or a brillo pad in the top, it will keep pins and needles sharp as you place and remove them.